With this Avery Translucent Document Wallet, your documents travel in style to arrive at your destination looking as fresh as the moment you slid them into the wallet. Durable translucent plastic encases your important documents securely during transport, and a sturdy die-cut flap closure ensures the Avery wallet remains sealed. Slip your business card into the sleeve on the front to complete the professional and capable impression you'll make. Predesigned Avery templates and software provide easy customization of title pages. Transcript: Welcome to MyBinding.com. This is the Translucent Document Wallet from Avery. Keep your documents looking fresh with the document wallet. The durable translucent plastic prevents bending and creasing and the sturdy die cut flap closure secures the contents and prevents liquids from getting inside. This wallet can hold enough pages for most presentations and on the front you can hold a couple business cards. Another great idea from Avery. Welcome to MyBinding.com. This is the Translucent Document Wallet from Avery. Thank you for your question. 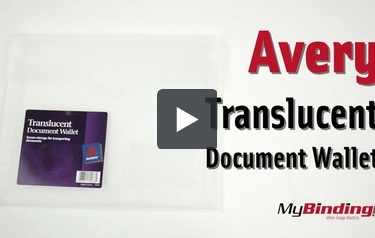 The Avery Translucent Document Wallet measures 11.6 x 9.2 x 0.2 inches.